Struggling with hunger pains while Intermittent Fasting or getting into Ketosis? Here are three low carb diet products that are incredibly helpful. When you first start Intermittent Fasting it can often feel like your stomach is going to eat itself by 10 am – the hunger pains hit but you’ve got a few more hours until you break your fast. Being on a low carb Ketogenic diet, and having Intermittent Fasted for nearly two years, I’ve had time to experiment with a multitude of Keto products available on the market. Here are three awesome products I’ve discovered to help suppress hunger and give you loads of energy, whether before a workout or simply on a typical workday. KetoForce is an amazing pre-workout supplement. 1tbsp taken 15 minutes pre-workout and you’ll feel like a superhuman for the next 2–3 hours. KetoForce contains the endogenous ketone body beta-hydroxybutyrate (BHB). It means it will temporarily raise your blood's ketone levels, helping you get into ketosis, while suppressing your appetite, increasing mental focus, and giving you more energy – great for anyone getting into ketosis for the first time, or for ongoing maintenance once you're in. Taken pre-workout it will decrease the amount of oxygen consumed by your body, especially during high-intensity aerobic exercise, resulting in increased physical performance and energy. I take it before spin class and feel incredible! I should warn you, however, it's an acquired taste, to say the least! Mix it with lemon water to take the edge off. Even if you're not a tea drinker, this stuff is delicious! 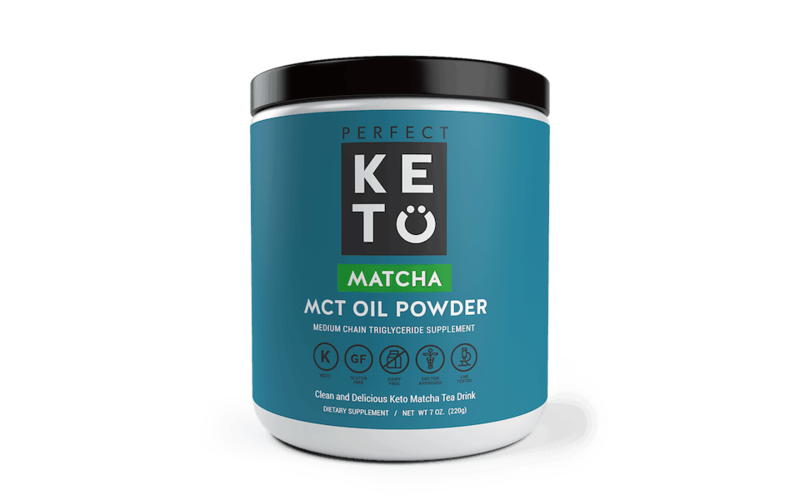 Some of the best quality matcha powder I've ever come across, this Matcha Latte with MCT Oil will help induce or maintain ketosis, while boosting energy and detoxing the body. Personally, I love mixing it with a shot of unsweetened vanilla almond milk. Once again, it'll help you maintain ketosis, suppress appetite, increase mental focus, and give you an extra boost of energy during workouts. It’s also dairy and gluten-free! I’m a big fan of Bulletproof Brain Octane MCT Oil in my morning coffee, but it doesn’t always work so well in shakes or baked goods. Thankfully, Quest Nutrition has developed an incredibly delicious MCT Oil Powder that produces the same great mental energy and focus but can be mixed into your favourite smoothy or shake. Have a great Keto product that you love? Let me know in the comments below.